BJP leader BS Yeddyurappa on Friday denied allegations of paying Rs 1810 crores bribe to senior BJP leaders and judges to become the chief minister of Karnataka. Terming the content of his diary fake, Yeddyurappa said that the Congress had run out of ideas and was ‘frustrated’ with the ‘growing popularity of Prime Minister Narendra Modi. Congress party and its leaders are bankrupt of ideas, they are frustrated with growing popularity of the Modi ji, they have lost the battle before it began. I-T Department officials have already proved that the documents are forged and fake,” Yeddyurappa was quoted by news agency ANI. Reacting to Yeddyurappa’s charge, senior Congress leader and former chief minister of Karnataka, Siddaramaiah, said that ‘any person against whom allegations are made’ was unlikely to own it. 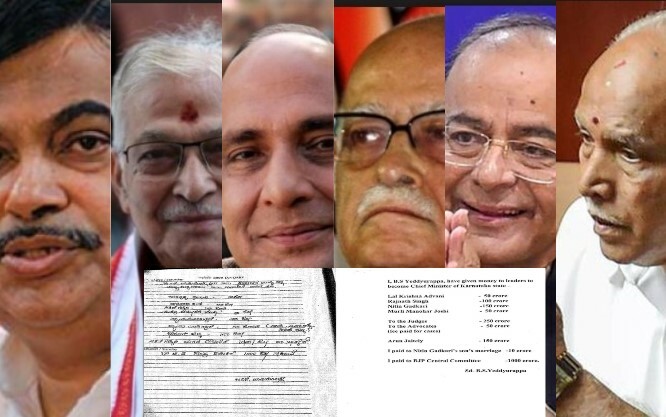 This was after the Congress on Friday addressed a news conference to allege that an old diary of Yeddyurappa had revealed how he paid Rs 1810 crore to Arun Jaitley, Nitin Gadkari, Rajnath Singh, LK Advani and several judges to become the chief minister of Karnataka. According to a report published by The Caravan website, Yuddyurappa allegedly paid Rs 150 crore each to Jaitley and Gadkari, Rs 100 crore to Rajnath Singh, Rs 50 crore to Murli Manohar Joshi, another Rs 50 crore to advocates as fee for cases, Rs 250 crore to several judges, Rs 10 crore towards Gadkari’s son’s marriage and a whopping Rs 1,000 crore to the BJP Central Committee. 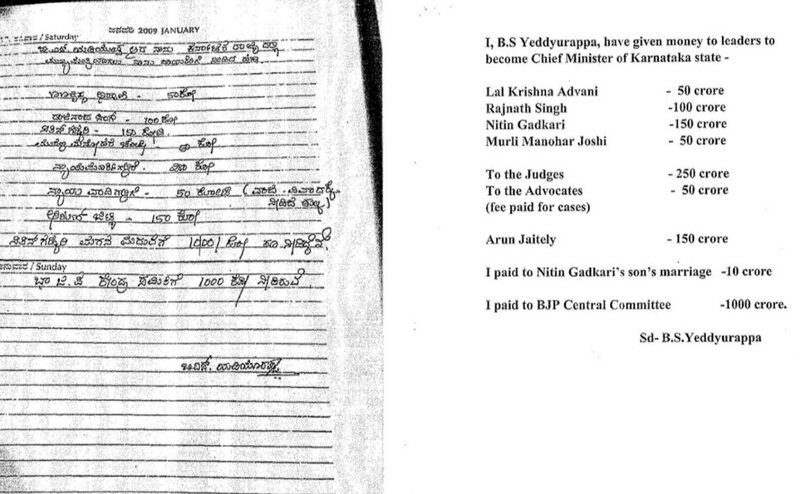 The identity of judges being allegedly bribed by Yeddyurappa continues to remain a mystery.